Legendary Bucks garage-psych warriors THEE HYPNOTICS are set to return for a series of dates this spring. Playing their first shows for 20 years, the band will have a major anthology out to coincide. 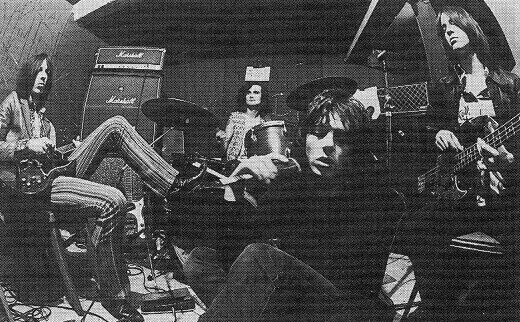 Formed in High Wycombe in the late 80s under the influence of the MC5, The Stooges and The Doors, Thee Hypnotics immediately drew attention to themselves with a series of incendiary gigs and the classic ‘Justice In Freedom’ and ‘Soul Trader’ singles. Capturing their onstage energy with their live debut album Live’r Than God, they quickly found fortune in the US, where they were the first UK signing to Sub Pop, eventually hooking up with Rick Rubin’s American Recordings for their third and final studio album The Very Crystal Speed Machine, produced by Black Crowes’ Chris Robinson. Singer Jim Jones would later go on to front Black Moses, The Jim Jones Revue and The Righteous Mind. Reuniting with guitarist Ray Hanson, drummer Phil Smith and bassist Jeremy Cottingham, the band play the following dates…. Tickets are available from the band’s website. Check out the video for ‘Justice In Freedom’. ‹ EARLY STRANGLERS ALBUMS REISSUED! Yep,I saw them in Glasgow.Absolutely brilliant,They rocked the house big time go see them.